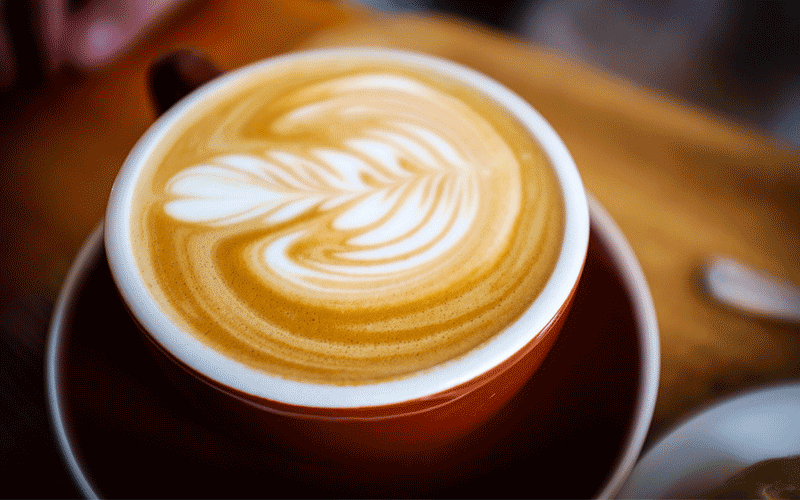 Do you love the smooth, foamy texture of a coffee shop latte? Do you often crave a delicious, milky hot chocolate? By adding a milk frother to your kitchen utensil collection, you will be able to have hot, café-style drinks in your very own home. But how do you know which is the best milk frother? Let us help you. We have taken care of the research and are providing you with some of the best milk frothers in the UK. Check out our milk frother reviews, the hardest decision you’ll have to make is which drink to make first! 4 Which is the Best Milk Frother? First of all, you need to understand the three types of milk frothers – Automatic, Handheld or Manual. Both work in a similar fashion that involves small whisks moving at speed to froth and warm the milk. The key difference is that an automatic will include some vessel that you add the milk to, place the lid (which includes the whisk) on top, and just press a button. You are then hands-free to get the rest of the coffee essentials ready. The automatic versions also heat the milk to a desirable temperature. The handheld version is just that – hand held. They will only work when you keep your finger pressed on the button, so you are unable to multi-task. The manual version requires that you actually pump and whisk the milk yourself. Both the handheld and manual variety only performs the function of frothing, if you like your milk warm, you would have to heat it separately. However, you do have more control of the outcome of your frothed milk. Automatic milk frothers are extremely convenient, allowing you to prepare the rest of your drinks whilst waiting for your milk. They can add style to your kitchen, and your friends will be envious of your barista-quality coffee. 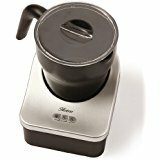 Here are five of the best automatic milk frothers available for purchase in the U.K.
Severin has developed a high quality, elegant-looking milk frother. 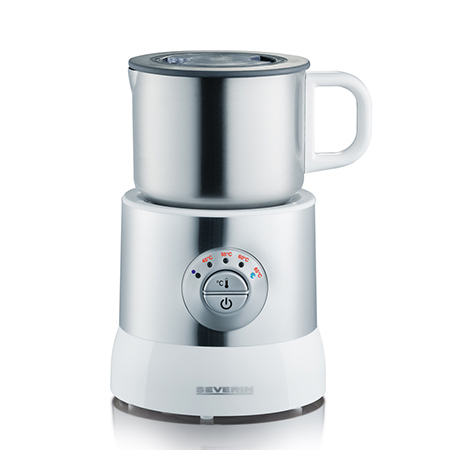 The maximum capacity of the Severin Induction Electric Milk Frother is 700mls, but it is important to note that this is for heating only. If you wish to froth your milk, you will only be able to do 350mls at a time. There are four adjustable temperature settings – 45, 55, 60 and 65 degrees Celsius, these are indicated by LED lights. Made from stainless steel, the frothing jug can be detached from the base to making pouring easier. After heating, the appliance must be left to completely cool down before its next use. If it has not been disconnected from the main power source, the on/off switch must be pressed twice in order for the milk frother to start a new operating cycle. This milk frother is equipped with an automatic safety cut-out which helps prevent burnt milk. It is a durable, well-made milk frother. It can heat more milk than many of its competitors. The adjustable heat settings are clearly indicated using LED lights making this frother very easy to use. The 360-degree swivel base makes putting the jug away quick and easy. An easily removed lid means you can add flavour to your drink, such as cocoa. It is covered by a two-year guarantee. The induction heater works quietly, making it suitable for office environments or early morning coffees. It is more expensive than other, similar products on the market. The large size may not be suitable for smaller kitchens or areas where space is limited. This stylish milk frother comes in both black and red and adds class to your kitchen. It can hold up to 300mls of milk which is enough to make several foamy drinks. If you prefer your milk less on the frothy side and just warm, simply remove the attachment, turning the device into a milk steamer, and your milk will only be heated. 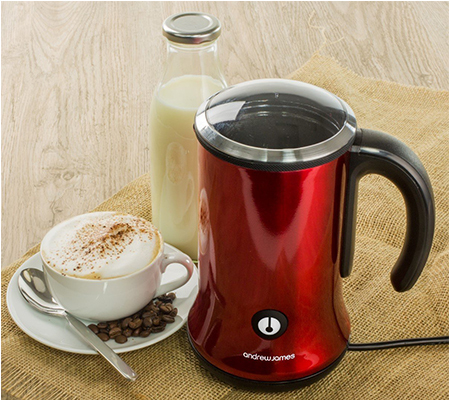 Two pre-set functions mean that you can have your milk frothed to your liking with the simple touch of a button and the powerful 450W motor heats the milk quickly. Cleaning is a breeze thanks to the non-stick interior coating and the two-year warranty will cover any unforeseen damages. The Andrew James Milk Frother will heat your milk to a very comfortable 62-72 degrees Celsius meaning your delicious beverage can be enjoyed immediately. Milk is heated quickly in around 2-3 minutes. Pre-set functions make it easy to use. The cordless 360-degree swivel jug allows for easy serving. It is perfect for a range of drinks including milkshakes, hots chocolates and lattes. After use, the milk frother takes nine minutes to cool down. During this time it cannot be used which may make catering for large groups time consuming. However, adding cold water to the container will help speed up the cool down process. Despite being advertised as cordless, the milk frother must be plugged in to work. Once the milk has been heated and frothed, it can then be removed from the base for easy pouring. 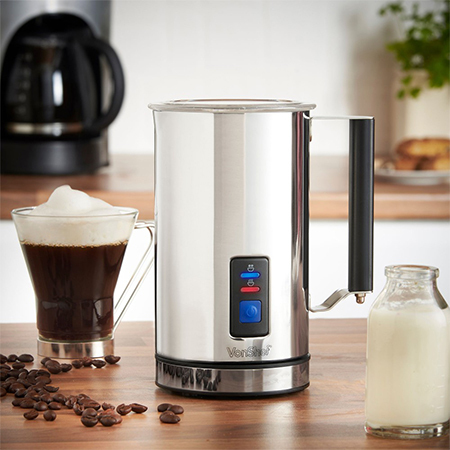 The VonShef Electric Milk Frother is a key tool in making the perfect hot drink. Getting your milk right is easy with this frother courtesy of two interchangeable whisk attachments. One attachment will create creamy foam and the other will simply heat the milk to an ideal temperature. The design is pleasing on the eye, and the indicator light will let you know when your milk is ready – heated to perfection at around 65 degrees Celsius. It works quickly, with 115 ml of milk taking 65 seconds to froth and 240 ml will be heated in a mere 130 seconds. With a stainless steel housing and a non-stick coating on the inside, the VonShef milk frother is durable and easy to clean. It is a cordless frother, so it can be used anywhere. The base can be swivelled 360 degrees which makes replacing the jug really easy. The automatic shut-off function and non-slip base ensure safe use. The heat resistant lid and handle mean you can pour your milk as soon as it’s ready. Interchangeable whisk attachments make achieving your preferred consistency easy. Two colour options make it suitable for just about any décor. The two-year warranty means you are covered in the event of any damage. It has a smaller capacity than other milk frothers. Even when filled below the maximum line milk still spills out. This lowers the capacity even further. 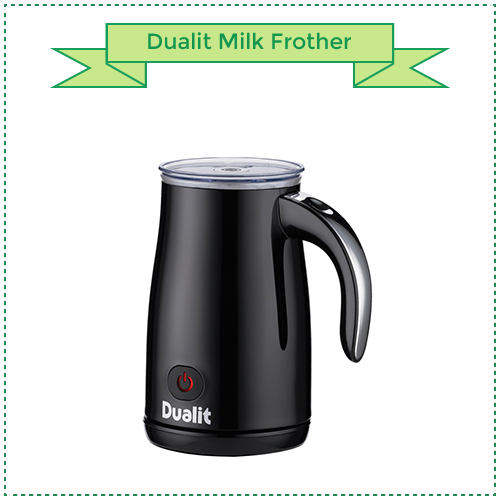 Dualit has completely re-engineered the cordless milk frother. This take-anywhere design produces hot milk as well as hot or cold frothed milk in under two minutes courtesy of the dual-function motor. The non-stick interior and removable whisk make for easy cleaning. If you would like hot milk, you can add 250mls of milk, which is enough to make several cups of coffee. However, frothed milk has a lower capacity of 150mls. The Dualit Milk Frother uses magnetism to keep the container sealed while in use, therefore minimising spills and mess. It will switch off automatically when the milk is at the right temperature ensuring it won’t burn. Black or stainless steel in colour, it is sure to match any kitchen décor. The cordless design means that you can take the jug all the way to the table when serving hot drinks. It is easy to use and easy to clean. Reset time is only two minutes (and can be sped up using cold water). This is much faster than many other milk frothers. A one year warranty will cover and damage caused to your milk frother. Only around two hot drinks can be made at one time, making it not very suitable for larger groups. It is not a durable milk frother. You may find yourself replacing it sooner rather than later. With three heat settings, two hot and one cold, the Hostess Milk Frother is perfect for cappuccinos, hot chocolates, and even heating your favourite soup. The jug can hold 250mls of milk, which is smaller than other milk frothers, but ideal for individual use. Cleaning is simple, both the jug and the lid are dishwasher safe. The jug sits neatly inside a base and can be placed inside in any direction, making it versatile for left and right-handed consumers. The three settings are easily identified by three simple buttons on the outside of the jug, making it very easy to use. The 600-watt heater heats milk up quickly. It easy to clean because it is safe to place in the dishwasher. This milk frother heats milk quickly, without burning. It is smaller than many other milk frothers, yet the price is not reflective in the price, making it quite an expensive milk frother. The durability of the design is questionable. Lavazza is a brand that has long been synonymous with coffee. Now, you can have café style hot drinks in the comfort of your own home. 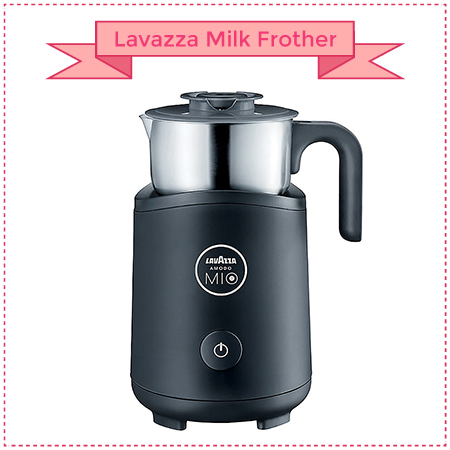 The Lavazza frother has a maximum working capacity of 120mls for frothing and 180mls for warning. The durable jug is simply placed in the base and you can have hot, foamy milk at the touch of a button. All the parts can be removed for easy cleaning, and the induction heat technology ensures milk is heated to the perfect temperature and consistency. It is the perfect coffee frother for all coffee lovers. Lavazza is a well-known and trusted brand. 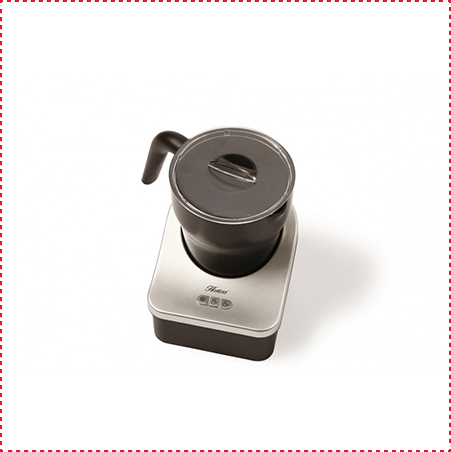 The large capacity makes it suitable for making many hot drinks at once. 500 watts of power makes heating the milk a quick process. Two whisks are included to create two different types of drinks – cappuccino or latte. The two-year guarantee eliminates any concerns about the milk frother breaking. There is small capacity for making frothed milk. The Severin Induction Milk Frother with its four heat settings and elegant design is the best milk frother. It provides frothy and hot milk without burning, and it is incredibly easy to use. If you are budget-conscious, you can’t beat the Andrew James Milk Frother. It’s lower price does not compromise quality, and with two colours to choose from, you are bound to find one to match your kitchen décor. 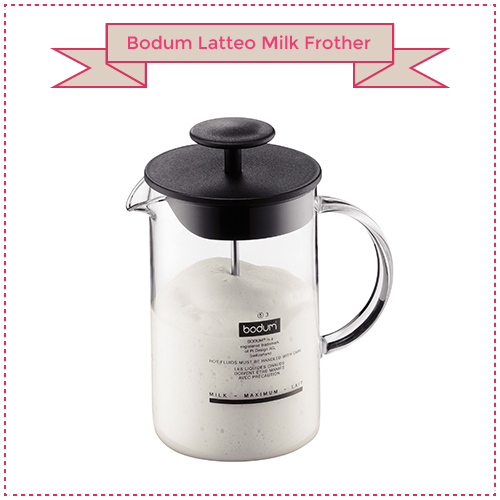 The Bodum milk frother requires your milk to be already heated; it is simply a frother only. However, the clear jug allows you to see how much milk you have added and the silk, the plastic lid has a deep rim to prevent spillages. The plunger handle is comfortable and offers a good grip, which is necessary as you need to pump it around 60-90 times to achieve frothed milk. It is an elegant design that is dishwasher safe, and at an unbeatable price, it is a great addition to your kitchen. The price is very reasonable and affordable. Spills are kept to a minimum courtesy of the deep-rimmed lid. The clear jug allows you to see exactly how much milk you have added. It can hold up to 250mls. The milk must already be heated if you wish to have hot milk. This is a frother only. Frothing is done manually which requires some effort and means that you cannot prepare your coffee at the same time. It also means that those with weaker hands or wrists might struggle with the design. This is a no-frills, simple milk frother. 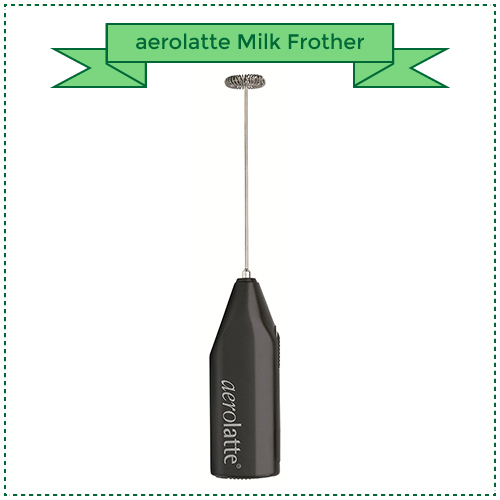 The handheld device by aerolatte allows for quick frothing in any location. In fact, it will take just 20 seconds to achieve perfect frothy milk. There are no cords to worry about; it is battery powered. This cordless function and the included storage case make it a perfect ‘take anywhere’ milk frother. The components are made from food-approved stainless steel to ensure safety as well as durability. If you desire hot milk, you will have to heat the milk separately, but this neat little frother guarantees foamy milk at the perfect consistency. Batteries are included and will provide around 150 hours of frothing. You are not limited to frothing milk. The aerolatte is great for making soups, dressings, vinaigrettes and desserts. It is small so it won’t take up much space in your kitchen – it can easily be stored in a drawer. It is a cheap and effective milk frother. It is a frother only, if you want warm milk it must be done either before or after the frothing process. Even though it is battery-powered and frothing is easy, you cannot multi-task and prepare the rest of your drinks. This will increase your coffee-making time. We have reviewed some of the best milk frothers in the U.K. Whether you are after a handheld device or a more convenient, electric milk frother, we have found what you are looking for. Imagine how much money you will save by serving top quality, barista-style coffee at home. All you have to do is go out and buy your desired frother and you can start sipping away on your favourite foamy drink.